There seems to be a movement. A movement that I am a little late in joining but joining none-the-less. This movement is to eat "real" food, "clean" food. And it's awesome. I used to be the one who poked fun at the "crunchy granola" moms and now I want to be one. Well, okay, I probably won't make it to "crunchy granola" status anytime soon but I'm taking it one step at a time. There are so many great resources out there if you are wanting to "jump on the bandwagon" and might I encourage jumping because it's GOOD for you. This is a bandwagon that you want to be on. This isn't the "healthy eating" bandwagon that the food industry wants you to jump on. This is the "real" food bandwagon that you should jump on. This bandwagon is about the health of you and your family. This bandwagon is full of support and encouragement but it's not easy. It takes some planning and preparation but is SO worth it. I've pretty much been in the middle of the whole clean/real eating vs processed foods. Dinners usually consist of a meat, a starch and a veggie. Sometimes we throw in a fruit and/or some bread and call it good. It's been a long time since I've made dinner out of a box but I have done it. My kids have eaten those frozen entree dinners and we probably will still get a Stouffers lasagna from time to time. I've still never made my own lasagna...my hubby has, but not me...not sure why it intimidates me so much but it does. Maybe that'll be my goal for the year! We've always been a family that uses real butter and not plastic margarine. I used to buy american cheese slices but not any more. We don't drink soda. We've got a good start but a long way to go. It started with some friends who were eating real food, then I started reading some blogs and articles about real food. I read articles about sugars and oils and how bad they are. I read articles about microwave popcorn and flouride. I don't understand why things that are outlawed in other countries are okay for us in America. Why don't we open our eyes and see the junk that is before us. So, eating real food and clean food is not always easy but it is beneficial. There are a few rules that I try to follow now when making my meal plan and doing my grocery shopping. 1) Shop the perimeter of the store. That's where all the produce, meats, and dairy items are...where the REAL food lives! 2) If it's in a box it should have 5 or less ingredients and I should be able to read them all easily. 3) If people didn't eat it 100 years ago don't eat it now. 4) Eat only baked goods that I make from scratch. 5)Stay as far away from white flour and sugar as possible. These are not LAWS just really good suggestions. Yes, I know that I will not always be able to eat totally "real" and "clean" food, especially if someone is preparing dinner for me but I will do my best to cook this way for my family. I use my crock-pot a LOT for our dinners. I have a great 5 ingredient crock-pot cookbook and I love it!! It helps the budget and the recipes are delicious. But I only use the recipes that are made with real food. No "cream of whatever" soups, no boxed items, etc. Having a meal plan REALLY helps us to eat real healthy food. Like I said earlier, there are so many good resources out there for eating real/clean food. I will list my favorites at the end please take time to do some reading and research of your own. The information is incredible and beneficial but also OVERWHELMING! But my suggestions are to start small. Baby steps people. After reading all the articles that I've read I just want to crawl in a hole and never eat anything that doesn't grow in my own garden but I know that's not totally possible (yet ;)) so I start small. There are lots of good "real" food options out there, even at your normal run-of-the-mill grocery store. Start by choosing whole wheat pasta over the regular spaghetti. Choose brown rice instead of white rice. Buy more fruits and veggies. Here's a great list of 20 easy real food substitutions. Baby steps. Read the labels. You're not looking at the carbs, fats, calories...look at the ingredients. Are the things you are buying made with REAL food or processed junk? We stopped eating breakfast bars (and trust me the kids ate one every day for breakfast most of their lives) when I finally got smart and read the label...go read it. Horrifying. Three of the first four ingredients are SUGAR! And I was giving that to my kids first thing in the morning! Well, no more. We still have a ways to go. I still buy cereal (but I'm getting very choosy). I need to start making more homemade breakfasts (and not just my go-to crock-pot oatmeal) but I'm not a morning person so we're still eating cereal for the convenience of it all. But again, baby steps! I am FAR from having a 100% real/clean food diet but we're doing MUCH better than we were two months ago. I am making much more from scratch...even snacks, which is really where most of our processed foods came in. So today, I want to share with you three things that I do/bake on a regular basis to help with the real food snacking! 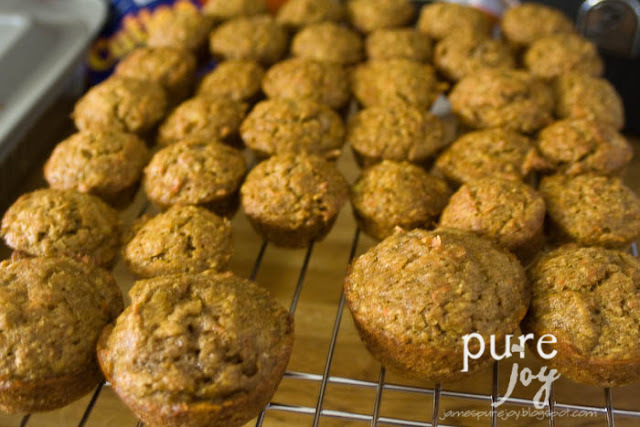 The first thing that I make a lot and freeze are these Toddler Muffins. They taste like banana bread but are made with whole wheat flour (the only thing I changed from the posted recipe), oat bran, bananas, carrots, and squash!! My kids LOVE them and I love making them and feel good about letting them have two or more (they are small after all)! The next thing I do is I buy fresh fruit, clean it, cut it up and put it in little containers and then put the containers in the freezer. Then on the days my kids stay for lunch at school I put the container in their lunch boxes...by the time they eat lunch the fruit it thawed enough for them to eat. I vary the fruit based on what's on sale and the kids love having fresh fruit in their lunch. And because it was frozen and I want it to thaw I don't worry about adding an ice pack to their lunch boxes. 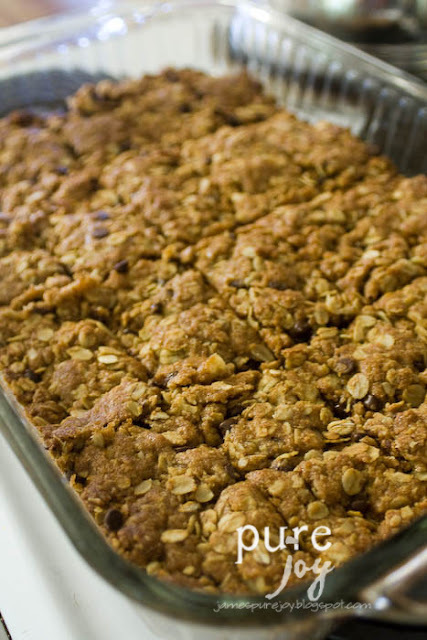 I've also started making my own granola bars. I used to eat granola bars all the time and then I realized what all was in them so I decided to make them myself. The first recipe I tried failed miserably and was barely edible but the recipe I'm going to share with you now (that came from my friend Marcia) is awesome and we all love them. I just need to find a way to substitute the canola oil for something else. I think I need to try it with coconut oil. Any other suggestions? Preheat oven to 350. Grease 9x13. Combine dry ingredients. Make well in center and stir in wet ingredients with wooden spoon. Pat mixture evenly into prepared pan. Bake for 30 in preheated oven or until brown around edges. Cool for 5, then cut while still warm. Plastic knives work well to minimize crumbs. Enjoy! Like I said it's a learning experience and I'm far from done learning but it's good to start somewhere and I feel better knowing that my family and I are eating a healthier diet with REAL food!! Here are some of my favorite REAL food resources! 100 days of real food - take your time with this site, there is A LOT of information and it's all REALLY good. This is probably my first resource for anything food related. Keeper of the Home - My second most used and probably tied with 100days for the best information...presented in a little bit of a different way but SOOO helpful in the journey of clean eating. This site has a LOT of good information for those of you who are just starting out with getting rid of processed foods. Eat at Home - great website for meal planning, good healthy food with crock-pot menus! The menus include a printable shopping list and everything I've made from this site has been delicious. Food Babe - just learned about this one but cannot wait to investigate it some more..."I am most knowledgeable about harmful ingredients in processed foods and how to avoid them. For this reason, I have made it my mission to spread as much information as I can about what is in food, how to make the right purchasing decisions at the grocery store and how to live an organic lifestyle in this over-processed world." The Blog of Bruce Bradley - Bruce is a former processed food exec turned food advocate, blogger, and author. Before his food advocacy work, Bruce worked for over fifteen years as a marketer at companies like General Mills, Pillsbury, and Nabisco. As one of the only former processed food marketers actively speaking out about concerns over the food we eat, the media often seeks Bruce out for his honest perspective. " Again, there is a LOT of information out there. There are some great resources. But here's my advice one more time. Start small. Don't beat yourself up for past mistakes or for eating processed junk. Just start to make changes. Chances are it will become such a good habit that your body will not crave the junk, the sugar, the processed junk anymore. And I'm sure you'll have more energy, maybe lose some weight, etc. Give it a shot!! This is a learning experience for me and I don't plan on being content with my limited knowledge as it is now, I will keep reading, learning and getting rid of the things that aren't good for my health and the health of my family. The next thing I'd like to tackle and learn more about...essential oils! Please feel free to share comments on your real food adventures or your favorite websites about real food. Please keep your comments nice and let's build each other up!! We're all in this together! I was not compensated by any of these websites to share their information...it's just great information and I wanted you to know about these great websites! This is wonderful that you are spreading the word. I've been on this bandwagon for over a decade now, even before it became popular. I grew up with my mom cooking every day from scratch, and that's how I've always fed my family too. My kids have NEVER had canned ravioli, or tv dinners. They don't even know what the inside isles of the grocery store look like. I'm proud of all that, but I have lots to work on still. We could always eat better, and healthier. Good for you for jumping on as well, I know it's hard at first, and there is so much to take in. You took the hardest step, and that is getting informed. From now on, the rest is easy. Once you know how bad most of the food out there is for you, it's almost impossible to feed it to your family or eat it yourself. Hope you have a fabulous day girl!! Bella, thanks for your encouragement. We've been pretty healthy eaters...but then i realized that "healthy" in America wasn't exactly real. I'll be over to check out your blog! This is wonderful! 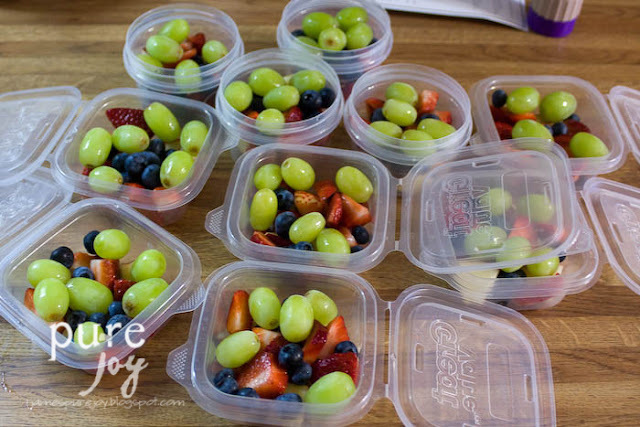 I love the idea of dividing up the fruit and freezing it...so smart!! Living in France for a total of 8 years, I can testify that the food is better...the fruits and vegetables taste better. No GMO stuff like here. I need to get better about eating real here!! Karen thanks for your comment. It's easy to eat clean when that's all that you're offered hey? Thanks so much for sharing. We have been slowly trying to make changes as well. Having a baby in the house again makes you take the steps backwards to realize what you are putting into everyones mouth!